At Sports Cards Plus, a.k.a. The Super Hit Factory, you always get more! Someone is going to WIN a factory sealed box of 2013-14 FLAWLESS Basketball and it could be YOU! All you have to do is give us your wrappers for any Panini Basketball Product. First Prize: A factory sealed box of 2013-14 FLAWLESS BASKETBALL. Second Prize: A factory sealed box of 2013-14 National Treasures Basketball. Third Prize: A factory sealed box of 2014-15 Paramount Basketball. 1. 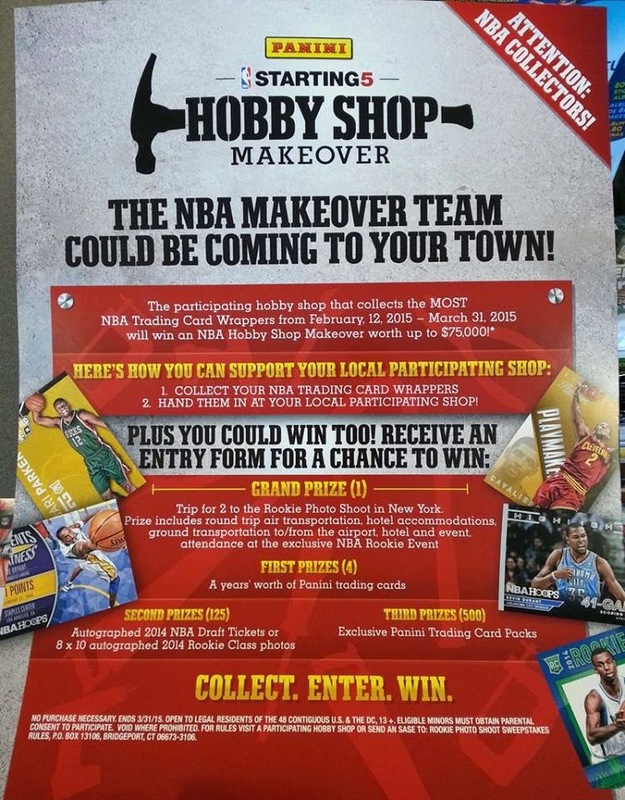 Get one entry for every $100 worth of Panini Basketball Products Wrappers you give us. 2. The Panini Basketball Product of the Day will earn you ONE Entry for purchasing $20 in packs and giving us the wrappers. Click HERE to check the possibilities on eBay. 1. An all-expenses paid trip to the 2015 NBA Rookie Photo Shoot in New York City. 2. FOUR Winners get "A year's worth of Panini Trading Cards." 3. 125 Winners get an autographed Draft Day Ticket or Photo. 4. 500 Winners get "Exclusive Panini Trading Cards." And, your every purchase at Sports Cards Plus gets you an Entry into our $500.00 Drawing. The amount you win is equal to the amount you spend (as listed on your entry ticket) and we keep pulling tickets until we reach $500.00. If you didn't make it in to Sports Cards Plus last week, below are some of the hits you missed. So what are you waiting for? Don't be the guy who says, "That could have been my picture." Go to Sports Cards Plus and pick your box from The BEST CASES in The Hobby at The LOWEST Price in The Galaxy (all of Texas).